1. After picking up your nuc, please do not leave it shut up in your vehicle as your bees will over heat and die. If you are traveling for a long distance, ensure that your nuc has adequate air flow (turn your AC to low if necessary). 2. 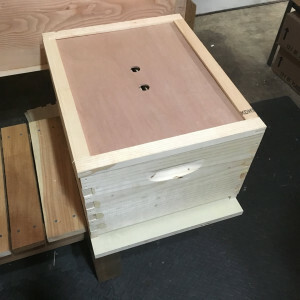 Immediately after arriving at the location where your hive is going to be located, place the nuc on a bottom board and your hive cover on the top of the nuc box to protect it from the elements. 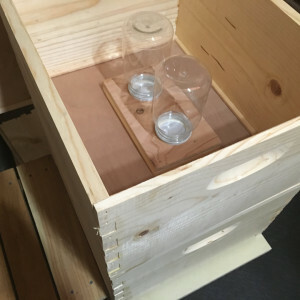 Remove the front cap to let the bees out of the box. Let your Nuc sit undisturbed for at least 6 hours to a day to allow the bees time to settle down after their long trip. If the temperature is not at least 60 degrees or it is raining do not install the nuc at this time. It is ok to keep the bees in the nuc box for a few days but not too long as they could swarm. 3. Once the weather permits install your nuc following the steps below. Remove the nuc from the bottom board and place an empty Deep Brood box on the bottom board. Place the nuc as close as possible to the Deep Brood box to prevent bees from dropping on the ground. Place two empty Deep frames on each side of the Deep Brood box. To calm the bees crack the lid of the nuc and lightly smoke the bees. Starting from the left side GENTLY REMOVE the outside Frame (if necessary gently push the other frames away from the outside frame). 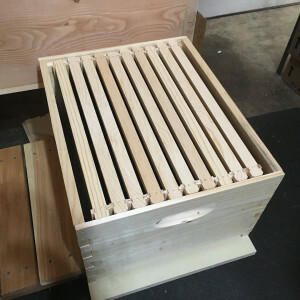 It is very important that the first frame is not against the side of the box or another frame, as it can roll the Queen and other bees if it is too tight. If you have to tear open the side of the box. Place the first frame on the left side of the Broad box keeping the frames in the same position that you remove them from. As you install you frames please check to see if you have any Queen cells. If you have a Queen cell please don’t remove it (If you see a Queen cell stay calm and locate the Queen). If you have a Queen cell and cannot locate the Queen please call me as soon as possible (360)807-3043 Alan). 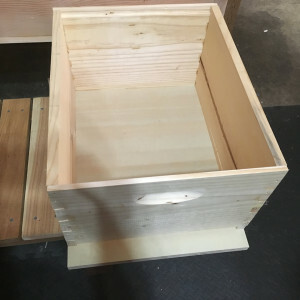 Once you have place your last Nuc frame in the Deep Brood box gently slide the two empty frames on the right side of the box against the nuc frame. Try not to squish any bees and definitely not the queen. Place the last empty frame in the Deep Brood box check the box to ensure that your if you did not see your queen check the box to ensure she is not still in there (If she is angle the box to let her crawl into the Deep Brood box (Please do not push or try and pick her up as you can injure her. 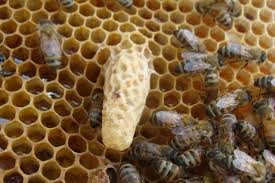 If there are only bees in the box leave it at the entrance of the hive and they will eventually fly in. 4. Close your box off. Place your inner cover on the first Deep Brood box. Place your second empty Deep Brood box on top of the inner cover. Place your feeder over the inner cover hole and add your sugar water. 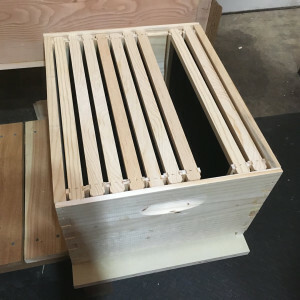 If you do not have this type of feeder it is important that you find a way to feed your bees using another type of top feeder, frame feeder or front feeder. Whatever you decide to use, you need to feed, feed, and feed. Please check your feeder but do not go back into the hive for 7 to 10 days as the bees are adjusting and will be fine. Continue feeding until your first Deep Brood box has about 80 percent drawn comb. At this time add your second Deep Brood box and keep feeding until it is filled or they stop taking it. Congratulation you have just installed a nuc. Now it's time to become a Beekeeper, please take care of your bees. How do I do this in the Long Langstroth hive? I have to admit I am a little nervous because everything I’ve learned from books and classes is geared toward the regular Langstroth boxes. I’m not exactly sure how to adapt. Your box is like other long langstroth and can be used in the same way. When I deliver your box I will show you how. Plus if you are not sure about the long langstroth I still have regular hives, call me. Will the queen come in a small cage or will she be loose? I have a lot of honey frames left over from my hives that died last winter. Everything is on medium frames. Can I just set a full medium box of honey frames on top of the deep to feed them (I am certain they did not die from chalk brood)? And then when they’ve drawn 80% of the deep, can I add another medium between the deep and the honey stores? Or I could pull a few honey frames from the middle and replace with brood frames to increase space. 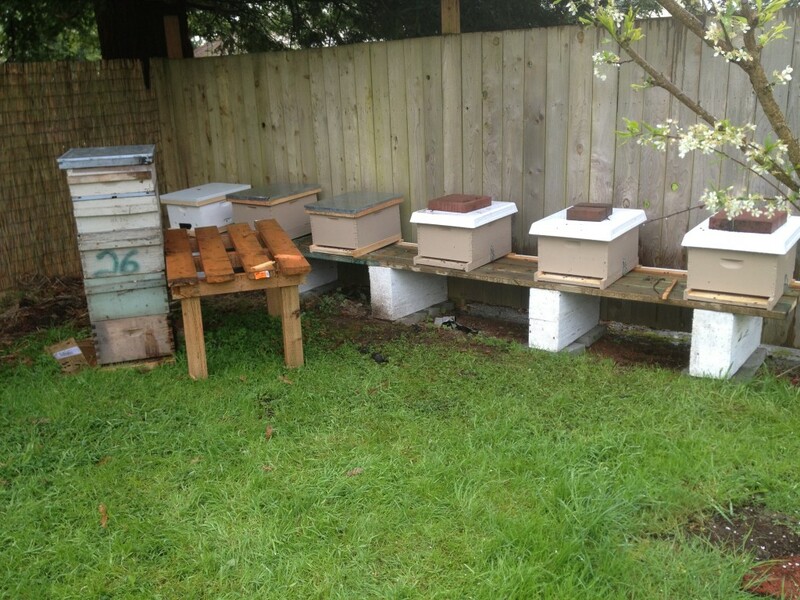 I am a new-bee (pun intended) but tend to lean more towards the Top Bar hive. Am I better off just getting your newbie kit instead? I am in Toutle and like the fact you are so close. 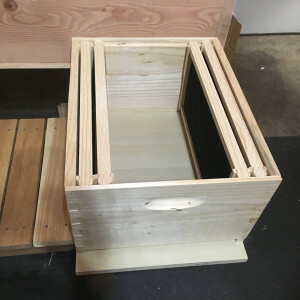 If you like the top bar hives we have a long Langstroth which gives you all the benefits of both the top bar and Langstroth hives without the lifting. 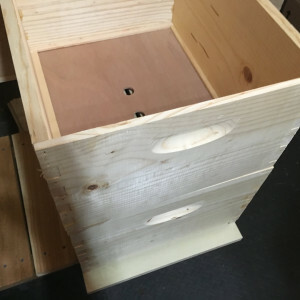 To see one please go to https://woodsbeeco.com/bee-hives/. I have a hive that died it was in its 5 th year and it has 10 deep frames full of honey and many others that are partial can I just put them in the new hives or what to do? Sorry to hear that Dan. I would like to ask how old are the frames in the hive. I hope that they are not five years old. I would suggest changing out your frames at least once every three years. Yes you can reuse those frames if they are not too old or the wax is too dark, mixing them with the new frames to build new wax. However, I would not depose of the old one because they make the best frames for swarm traps. 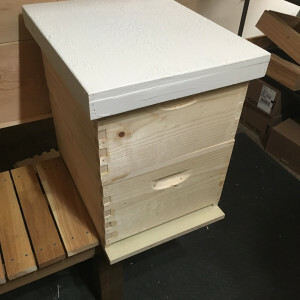 What are the benefits of the long Langstroth hive compared to the Langstroth hive stacking method? 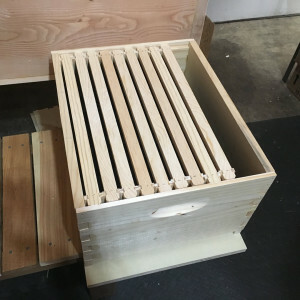 The reason the long Langstroth hive is growing in popularity is because of the ease of use. There is very little of no lifting required to maintain these hives. In fact I’ve put hinges on some of the supers so that a person can simply tilt it on its side with little effort. However I would also argue that it is like a top hive but with the ability to spin the frames.